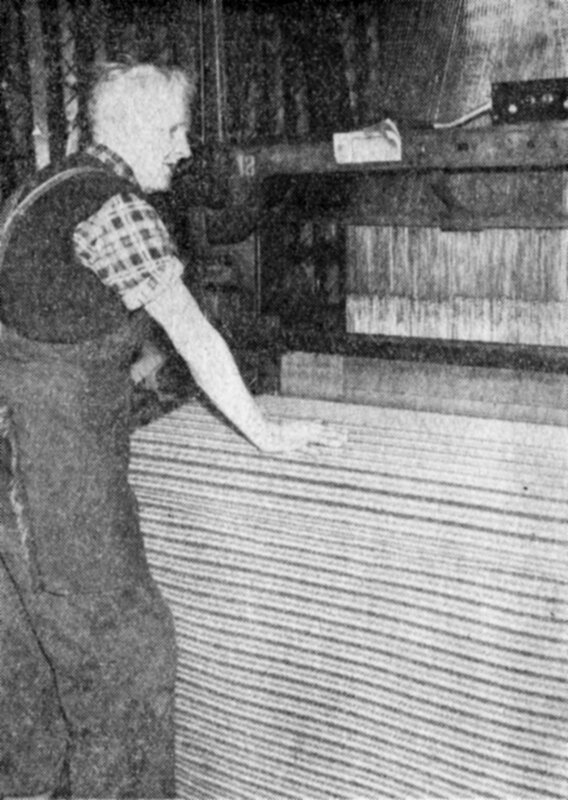 Mr. John Hill weaving some of the fabric at Shaw Lodge Mills, Halifax. A FAMOUS old Halifax textile firm John Holdsworth & Co Ltd, Shaw Lodge Mills, Halifax, has been selected to take part in "an adventure in design" . . . of a motor coach for holiday touring. Holdsworth's, leaders in the manufacture of moquettes for many years will be responsible for the seat moquettes, prepared to a special design. Everything about the coach, for Galleon World Travel, is "special", even down to the luggage labels provided for passengers. These are to be coloured like the coach itself, removing any possible errors in identification even on a crowded coach station. But the interior of the coach is the most important part. Sponsors of the "adventure in design" decided they should look no further than moquette, well tried and thoroughly practical. And when it came to deciding where the material should be manufactured the sponsors decided they need look no further than Halifax and its Shaw Lodge Mills. John and Sylvia Reid, husband and wife team of architects and industrial designers in charge of the detailed planning, saw in moquette a thoroughly practical material. There was just one snag. They did not want a standard moquette. This one must be very special. The task set for the Holdsworth designers led by Jack Thompson, will be appreciated by anybody in any branch of textiles. The colours and designs had to be translated in terms of cloth . . . it doesn't always work out. Experimenting with the width of the strips of colour and the depth of colour, firstly in the lofty design department at Shaw Lodge, and then in the mills themselves, the Holdsworth team evolved what they believed to be the right style, design and colour make-up that John and Sylvia Reid wanted. The Reids were delighted, so were the sponsors of the project. Holdsworths have not only got the order to weave the moquettes for the "adventure in design" - the project sponsors have invited them to tell their own story in a forthcoming magazine feature to be devoted to the coach. The organisers of the scheme like the finished product so much they are going ahead to refurbish some of their older coaches in the new "adventure" livery and style, which includes those Halifax moquettes.